We'll be very happy to talk to you! We offer a large range of products (styles, sizes, colours...), customised with your logo and text. To deal with this it's often better to talk to a human being. Please check our help pages to ensure that you're not asking a question that we've already answered! 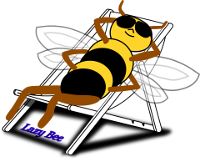 Please start on the main Lazy Bee Scripts web site. Send an e-mail to "webmaster"
Send an e-mail to "embroidery"